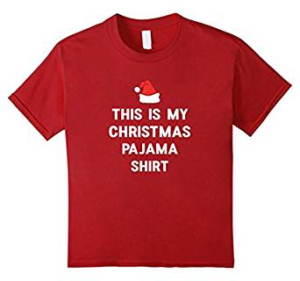 Let’s face it – Christmas pajamas are a holiday tradition for many families. We always had new pajamas to open up and wear on Christmas Eve. Robert and I continued the tradition with Charlie. When Charlie was little we took his Christmas jammies to the family party, he would wear them home and straight to bed, ready for Santa in the morning. That stopped about 4 years ago. I still get Charlie Christmas jammies every year but the style has changed as he’s gotten older. No longer the cute pj sets nor matching jammies with Mom. *sigh* Darn kid growing up. 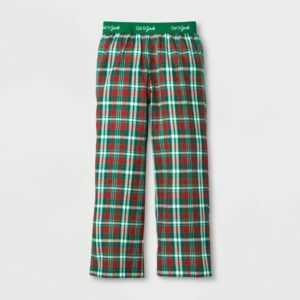 The trick to holiday pajamas is to get them early. As in before Thanksgiving if at all possible. Otherwise you run the risk of not finding anything online or locally in your kids’ size or style he/she would like or even deign to wear. This year I found the perfect Christmas jammies for Charlie. Pajama pants that aren’t too holiday looking and a t-shirt that isn’t cutesy. I found the top on Amazon and it is perfect! I found the pajama bottoms at Target just by accident. I was at Target for something else and figured while I was there I’d take a look. Voila! Teenager boy approved Christmas jammies! One thing marked off my holiday to-do list so yay. Does your family do Christmas jammies? Do you match or at least try to coordinate? Or have your kids outgrown this tradition?